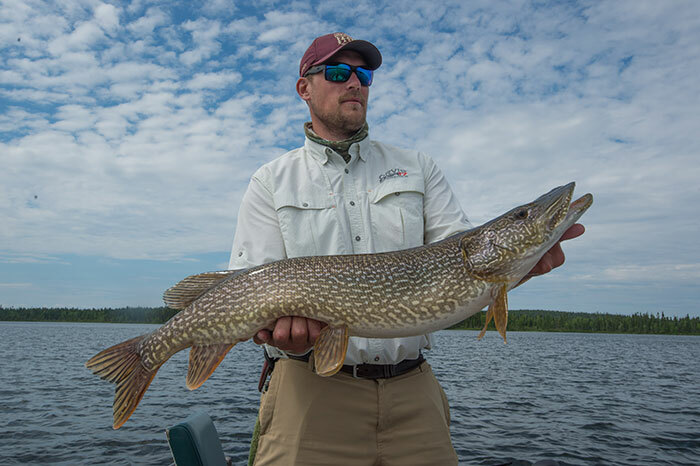 Orvis’s Tom Evenson prepares to release a 43-inch northern pike, which hit a topwatere slider pattern. and considering what fly to tie on, . . . The author hoists his first northern pike on a fly. Can you tell he’s excited? Wisconsin is well-known for its solid predator fishing, and muskies get almost all the attention. 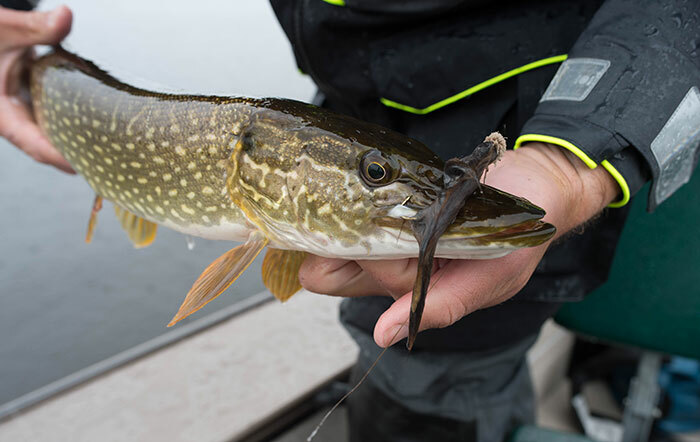 However, there’s another member of the Esox genus that’s significantly more abundant and, some would say just as fun, that you can fish for year round: . . .
Nick took to the fly rod quickly, after years of wanting to try it. Young Nick is becoming quite the outdoorsman. While fishing at Wollaston Lake Lodge with his family for the past few years, he kept eyeing the fly rod as his next challenge. After a few . . . This pike decided to attack the mouse fly from above, which made for an exciting strike. The rain started during the night, and we awoke to the steady thrum of big drops hitting the metal roof of our cabin at Wollaston Lake Lodge. The forecast called for things to get significantly . . .
Dan Lembke demonstrates the proper hold of a big northern pike in preparation for release. 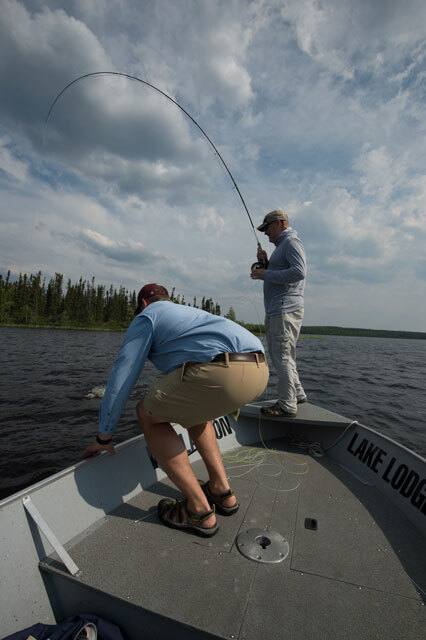 Our second day at Wollaston Lake Lodge (click here for a report on the first) promised weather much like the day before–80 degrees and sunny–and we were looking forward to trying to find some . . .
Another Wollaston Lake northern pike comes to the boat. At the 2018 Orvis Guide Rendezvous in Asheville, North Carolina, back in April, Wollaston Lake Lodge was announced as this year’s Endorsed Fly-Fishing Lodge of the Year. At the after . . . The 30-inch mark is an Alaskan distinction between really big rainbows and HUGE rainbows. 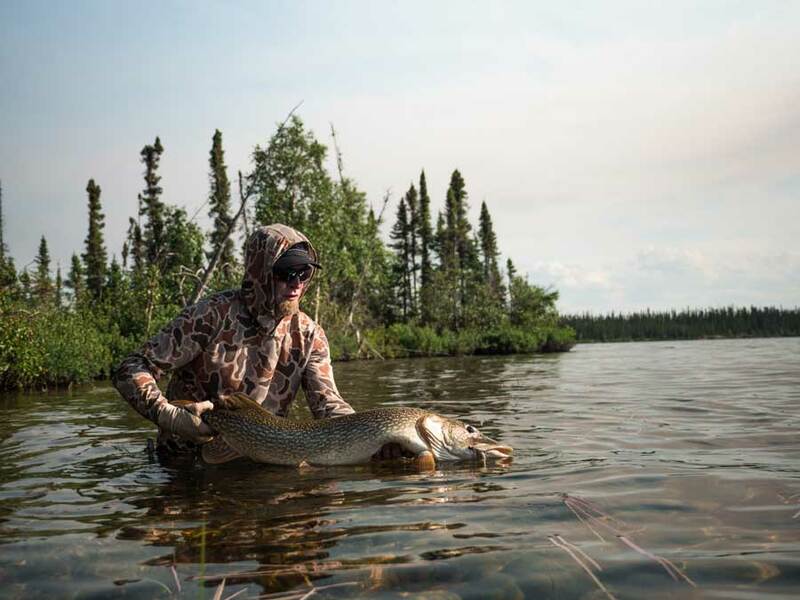 Alaska is blessed with an incredible wealth of sport-fishing opportunities—from easy-to-reach streams that flow alongside highways or right through town, to remote waters accessible . . .
Young River learns the satisfaction of catching a big fish on a fly you tied yourself. Twelve-year-old River is on his second trip to Wollaston Lake Lodge this week. He loves fishing, and traveled to Canada with his father, grandfather and brother. He is quite the young man, . 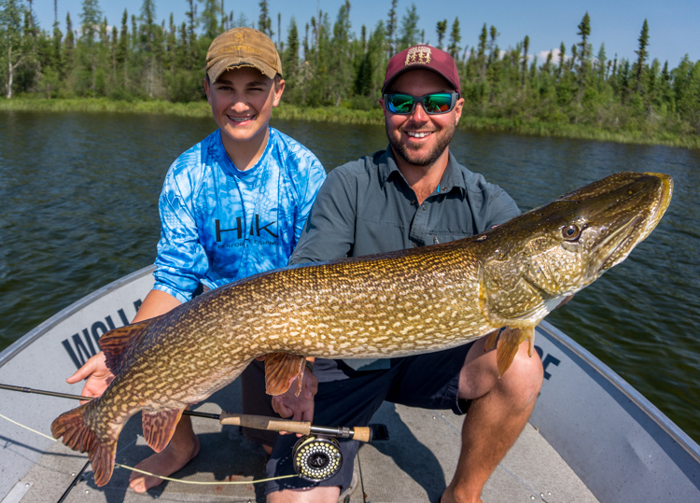 . .
Just minutes after learning to cast, Zane was into some big northern pike. Being a guide is not just taking folks fishing. 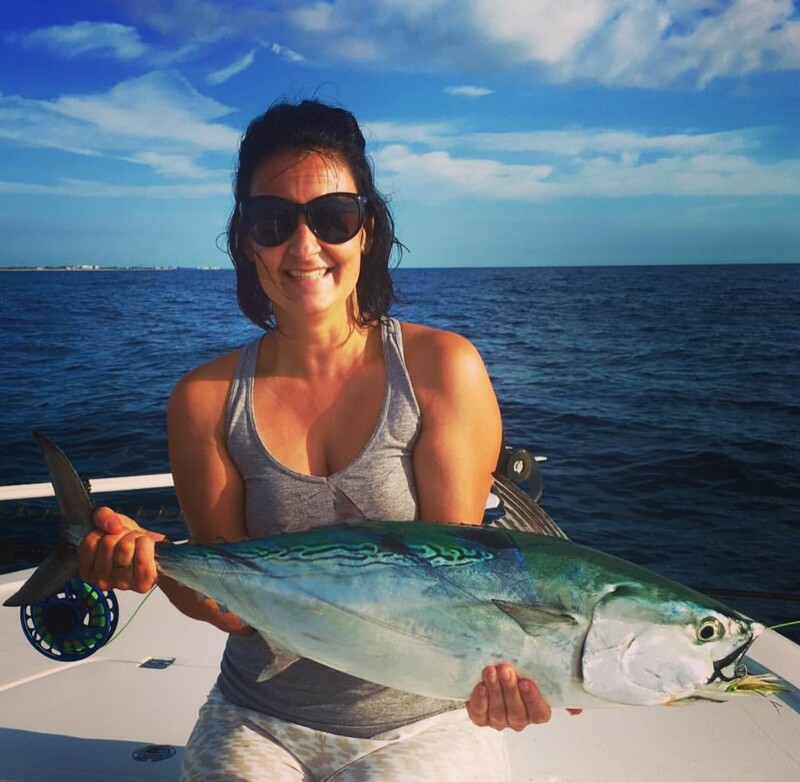 The experiences that people share in the boat sometimes are just as memorable as the fish they catch. Teaching someone something. 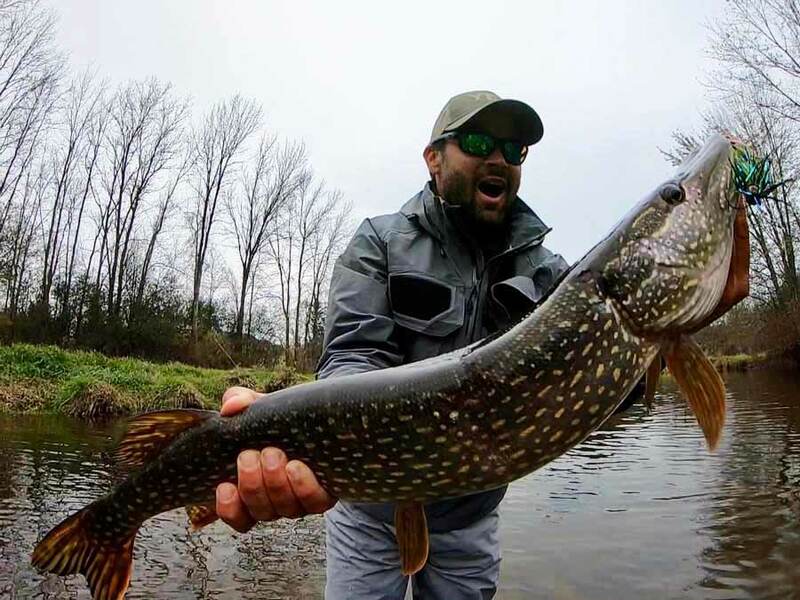 . .
Kubie Brown is all smiles, as he holds a 40+-inch northern pike from Upstate New York. Every year, I head up to the Adirondacks with my brother and my buddy, Justin, to hunt the ponds, lakes, and rivers of the region for big post-spawn northern pike. In the past, we’ve found that. . .